The timeless trend’s versatility is the reason it resurfaces season after season. Embrace your dark side with florals atop a moody backdrop, or light up the atmosphere in a raised brocade texture with a hint of sheen. The final factor? Silhouette! Flatter your figure with a mermaid style that nips in above the knees, or go for a high-low skirt to show off killer heels. Quick rule of thumb: if you’re petite, an allover print can easily overwhelm your frame, so look for figure-hugging silhouettes that show off your shape. Taller ladies, you’ve got some leeway: any style flatters your height! How to accessorize your floral print prom dress? With subtle touches; keep makeup soft and minimal and stick to just one piece of jewelry, like a dainty necklace or drop earrings. Set the tone for spring with a beautiful pattern and flawless fit; think of our collection as your personal bouquet of styles! Which will you pick from the bunch? 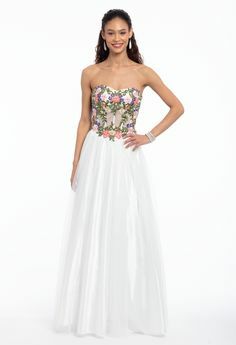 Find even more floral prom dresses on CLV.com!